Andrew Comiskey sees our weakness as "a threshold for holy power"--the point at which God can meet us for healing and equip us for service. He has seen it happen again and again. During many years of ministry, Comiskey, his wife, Annette, and their fellow "strugglers" have accompanied hundreds of wounded men and women to transformation at the cross of Christ. Telling real-life stories of despair, hope and lasting change, Comiskey lays out the foundations for healing from relational and sexual sin. 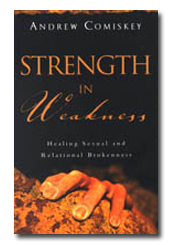 With chapters focusing on particular areas of vulnerability for men and women, on the battle over homosexuality in church and culture, and on the essential role of the church in ongoing healing, Strength in Weakness makes clear the way to the cross--God's sufficient answer to our deepest needs.